Unlike with most other slots, in Everybody’s Jackpot you should take its title literally - whenever the progressive jackpot hits, everybody who wagered enough in the last 24 hours gets some portion of it. The only person who might not like it, is the actual jackpot winner, who gets only 70% of the advertised amount. This unique feature makes up for all the creepy graphics. Everybody's Jackpot slot by Playtech looks like a TV game show. This implies typical “suspense” sounds of spinning reels, studio-themed background, and a couple of hosts-characters, made in creepiest possible 3D-graphics. Other than those characters and stuttering animations, the game looks alright. Once you find out about its signature feature, you’ll forget about those characters altogether. The title kinda gives it away - the progressive jackpot in Everybody's Jackpot is shared (unequally) between all qualifying players. This would have been enough to make it special, but it also has a round of free spins with a wild symbol. The structure of the main game resembles classic slots - 3 reels, 8 paylines, no wild. Most combinations need three matching symbols to pay. Now, the Jackpot feature. First of all, there are no special symbols triggering it. It just happens randomly at any spin. A player who wins the jackpot gets 70% of the pot. 15% are equally shared between all players who wagered at least €50 within last 24 hours (whether or not you qualify is shown in the game interface). And the last 15% portion is also shared, but your share depends on how much exactly you had wagered. This makes the “arrrgh, why it wasn’t me? !” feeling when someone wins a jackpot on the game you’ve been playing the whole week that much less infuriating. When someone hits the jackpot, all players who wagered €50 in the game within last 24 hours share 30% of it. 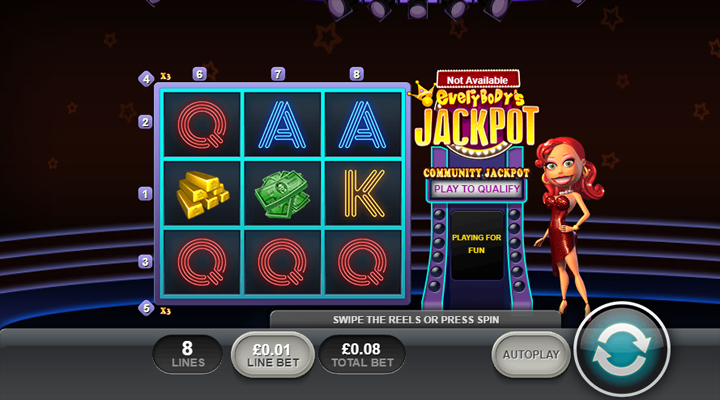 The free spins round stars when three or more scatter symbols (game logo) appear on the reels. You get 12 spins, and there’s a chance that the wild symbol will occupy the center of the middle reel. Three more scatters re-trigger the feature. Everybody's Jackpot has a truly unique feature that makes it stand out. The progressive jackpot is literally everybody’s, and the only thing you have to do to get at least a part of it, is to play the game. Click here to play Everybody's Jackpot slot, because where else can you win a jackpot by not winning it?